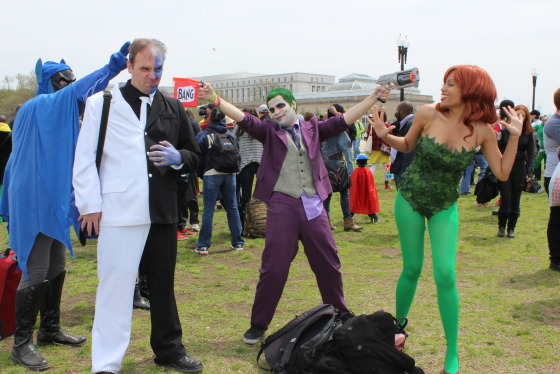 Home » Latest News » Awesome Con superheros visit D.C. Awesome Con superheros visit D.C. Many dressed as superheros congregated on the mall attempting to break China's record for the most people dressed up as a superhero in one place -- a phenomenon known as 'cosplay'. WASHINGTON — Batman, Spider-Man, Superman and similar superheros are gracing the streets of D.C. Friday attempting to break a world record for Awesome Con. Comic book fans dressed up in superhero-style costumes gathered in front of the U.S. Capitol Reflecting Pool to break the Guinness World Record for having the most people dressed up as comic book characters. “It’s like a sea of comic book costumes. It’s really awesome,” says Jaime Britt, a resident of Maryland dressed up as Batman. As a way to kick off the weekend-long comic book and sci-fi convention, Awesome Conventions LLC and the Museum of Science Fiction organized the gathering aiming to beat China’s 2011 record of having 1,530 people wear costumes to represent a specific character — a hobby known as cosplay. “We’re a little bit under,” says Annie Armitur, line producer and interviewer for Awesome Con. The final count of participants in full costumes was 236. Nevertheless, she says the gathering went very well for a first attempt and there’s always next year. The official counter for the Guinness World Records, Annie Nguyen of New York, came to approve costumes and characters. “We were counting one-by-one for each person to come in, since I need to see their full costume,” Nguyen says. A high school freshman from McLean, Va., Suzanna Kani, dressed up as Scarlet Witch — a character from “X-Men.” Kani made the costume herself in two days. “I thought it would be somewhat easy for me to crochet,” she says. Although Kani won’t be attending the convention this weekend, she still wanted to be a part of the cosplay event. “It’s really exciting being around people that have a passion for costuming and all coming together to try to break a record,” Kani says. Maiya Fox and Jeff Robinson, a couple dressed up as Clark Kent and Superman, first met an anime convention. Fox has been attending cosplay events and comic book conventions every year since her first year of college. “Being a geek and being into this, some people don’t approve or judge, or some people think it’s just for kids, and meeting people who like the same things and won’t judge you for it, is actually pretty hard,” Fox says. “I’m a lifelong sci-fi geek,” Britt, dressed as Batman, says. He took off work to come out with his children for the event, since it’s his daughter’s first major cosplay event. Britt and his family are looking forward to meeting the celebrity guests at the convention. Billie Piper from the show “Doctor Who,” and cast members from “The Walking Dead” are expected to attend. Armitur says the convention is fun and a great way for people to meet. In addition to celebrity guests, more than 100 comic book creators will be there for discussion panels, contests and activities. Awesome Con will be held at the Washington Convention Center from April 18 to April 20. Comic book cosplayers and fans descend on D.C. for the second annual Awesome Con.